Finally! Two Witness Preparation DVDs that Will Prepare Your Witnesses for Deposition or Trial--Now Includes Spanish and Chinese Translations! Witness Preparation for Deposition: You will be a credible witness at your deposition! Witness Preparation for Trial: You will be a credible witness at trial! Witness preparation, for depositions or trial, can be a time-consuming process. What's more, an unprepared witness can jeopardize an entire case. Most witnesses have no experience in testifying, so witness preparation needs to be thorough and engaging. This 2-DVD set contains one DVD focused exclusively on deposition testimony, and another for trial testimony. After watching these DVDs, witnesses will be more informed, confident, and comfortable in testifying. The DVDs address what the witness should expect in terms of environment, questioning, procedure, and good, conservative advice for attire, demeanor, grooming, and attitude. They focus on the important 3 Steps (Listen, Think, then Answer), and the 10 C’s of Credibility. Each DVD is accompanied by a take-home witness booklet which covers all the points on the DVD. The Forensic Examiner Book Review, Katherine Ramsland, Ph.D.
“Ever wondered if you adequately prepared a client or lay witness to testify with accuracy and confidence? 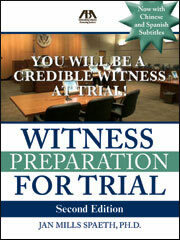 If so, you may want to review “You Will Be a Credible Witness at Trial.”…This DVD aims to aid the novice or nervous client or lay witness to develop confidence in presenting truthful testimony in a courtroom…A diverse group of actors do a great job of portraying witnesses and court personnel, and thus make the 40-minute presentation an effective learning tool… The aim of the DVD is to aid in understanding the dos and don’ts of presenting testimony, i.e., how to respond to questions, how not to respond to questions, and to consider the demeanor and appearance of the witness…It provides a valuable reminder of fundamentals that counsel too often take for granted, and an excellent compendium of tips to incorporate in witness preparation.."
The Champion, Book & DVD Review, Geneva Vanderhorst, J.D. "Good job!...thorough and informative. They will help our witnesses avoid many of the errors that we see and hear regularly. The use of these DVDs will save considerable lawyer time and greatly assist the witness's preparation for trial. I recommend these DVDs to any lawyer whose practice involves depositions and trials. They will be of great benefit to attorneys, clients, and witnesses and useful to beginning lawyers to help them understand the deposition/trial witness preparation process." Michael L. Piccarreta, Adjunct Professor, James E. Rogers College of Law, University of Arizona, Piccarreta Davis, P.C. "Very well done! This helpful, well-made video makes a lawyer's job much easier by covering the important topics and sound advice relevant to every witness's testimony. After watching the video, our witnesses were more comfortable and confident, and I could focus additional preparation on the substantive facts and issues of the case." "These DVDs provide real assistance to counsel in guiding witnesses through what can be a scary prospect. Not preachy or intimidating, these videos set just the right tone in providing guidance while inspiring confidence. After watching these programs, a witness should be much better prepared." Philip R. Higdon, Esq., Perkins, Coie, Brown & Bain, P.A.